The cost of sheetrock varies based on a number of factors. What will your sheetrock project cost? Read on to gain a better understanding of how much you'll pay for the work. The cost of sheetrock projects varies from one to the next. Your sheetrock project won't cost the same as your neighbor's or your best friend's project. The specific dimensions and features of the room, the amount of work to be done, quality of materials and who does the work play a role in the overall cost of the project. Even the local market causes a difference in the final cost of the renovation. As with any home improvement project, sheetrock materials range on the price and quality spectrum. According to Cost Helper, the average price for the supplies alone is between 25 and 65 cents per square foot. This includes the actual sheetrock, the nails or screws, the joint compound and the tape for the seams in the sheetrock. Materials are the first half of the sheetrock expenses. The second figure to add to the total is the cost of labor for the installation. The finished look of the wall depends on the quality of work performed when the sheetrock is installed. If you feel confident in installing sheetrock yourself, there's great news. You'll have no labor costs! The exception is if you enlist the help of friends and offer them food and beverages, which is highly recommended. Workers with full stomachs are much more willing to work hard. You will definitely want extra people on hand for the project to assist with lifting and stabilizing the sheetrock as it is installed. 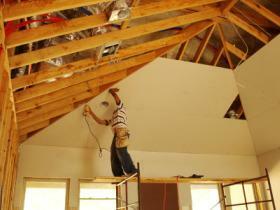 One added expense you may incur when doing your own sheetrock is securing a building permit. Check with your city to determine if a permit is needed and how much it will cost. Hiring a professional contractor relieves the stress from you. If you choose a high quality sheetrock contractor, the end result should be seamless and ready for finishing. The drawback to this option is the additional cost for labor. Cost Helper estimates that in addition to the material costs, you'll shell out an additional 85 cents to $1.50 per square foot. If your project is only one small room, this can mean a difference of around $300 to $500 over doing it yourself. For an entire home, expect to pay a few thousand dollars over the cost of supplies. The larger the home, the higher that figure climbs. Each sheetrock project ranges based on the scope of the project, the local area and the materials used. If you're making a few simple surface repairs yourself, the project will likely come in around $20. Handling your own sheetrock installation for a small room will likely cost between $150 and $300 for materials, plus any food or bribery money for the friends you recruit to help. The high end of the sheetrock cost spectrum can range anywhere from $4,000 to $8,000 for a full house sheetrock project completed by a professional. With such a wide range of costs, how can you determine what you'll pay for a sheetrock project? If you're doing the project alone, measure the room and head to your local home improvement store to get prices. Compare the quality of the products and calculate the cost for all of the materials needed. Ask one of the store employees for recommendations and assistance in cost calculations. If you decide to go with a professional installation, contact several contractors in the area to get estimates. They should offer free estimates for the entire project. It's always a good idea to ask family and friends for recommendations and check references of the contractors. Home improvement costs fluctuate often and other factors contribute to the cost of sheetrock projects. Taking accurate measurements and researching the local market helps determine an estimate for the total costs.